ETncAlosBed BLasEe TSables FLAT TOp uNiTS         Length Model # (Add ”M”) Model # Model # (Add ”M”) Feet 30 38 47 56 66 74 83 92 109 35 45 55 66 76 87 97 107 128 5156 41 5349 53 5786 65 6210 77 6911 90 7457 102 8445 114 8628 126 11496 151 Open Base Sliding Doors Hinged Doors w/ Fixed Mid-Shelf # of Doors w/ Fixed Mid-Shelf (Add ”M”) # of Doors Approx. w/ Fixed Mid-Shelf Cubic      EB-SS-243 EB-SS-244 EB-SS-245 EB-SS-246 EB-SS-247 EB-SS-248 EB-SS-249 EB-SS-2410 EB-SS-2412 $2587 M $3089 2684 M 3182 2873 M 3431 3063 M 3693 3334 M 4035 3504 M 4259 3970 M 4851 4152 M 5031 5737 M 6437 HB-SS-243 HB-SS-244 HB-SS-245 HB-SS-246 HB-SS-247 HB-SS-248 HB-SS-249 HB-SS-2410 HB-SS-2412 2 $4082 M $4585 2 4278 M 4776 2 4561 M 5119 4 4838 M 5468 4 5445 M 6149 4 5843 M 6600 4 6479 M 7362 4 6658 M 7539 6 8995 M 10112       EB-SS-303 EB-SS-304 EB-SS-305 EB-SS-306 EB-SS-307 EB-SS-308 EB-SS-309 EB-SS-3010 EB-SS-3012 2728 M 3299 2825 M 3398 3037 M 3693 3254 M 3981 3476 M 4285 3839 M 4742 4233 M 5287 4411 M 5467 6082 M 6779 CB-SS-244 CB-SS-245 CB-SS-246 CB-SS-247 CB-SS-248 CB-SS-249 CB-SS-2410 CB-SS-2412 2 $3693 M $4194 2 3969 M 4530 2 4255 M 4887 4 4865 M 5568 4 5256 M 6016 4 5891 M 6774 4 6075 M 6951 4 7437 M 8461 NOT AVAILABLE HB-SS-303 HB-SS-304 HB-SS-305 HB-SS-306 HB-SS-307 HB-SS-308 HB-SS-309 HB-SS-3010 HB-SS-3012 2 4224 M 4743 2 4412 M 4986 2 4727 M 5382 4 5032 M 5759 4 5586 M 6395 4 6059 M 6963 4 6740 M 7801 4 6920 M 7982 6 9468 M 10582           CB-SS-304 CB-SS-305 CB-SS-306 CB-SS-307 CB-SS-308 CB-SS-309 CB-SS-3010 CB-SS-3012 2 3833 M 4405 2 4136 M 4790 2 4444 M 5171 4 4999 M 5810 4 5474 M 6379 4 6150 M 7208 4 6330 M 7386 4 8230 M 9518 NOT AVAILABLE      NOT AVAILABLE   24” 3’ 4’ 5’ 6’ 7’ WIDE 8’ 9’   30” 10’ 12’ 3’ 4’ 5’ 6’ 7’ WIDE 8’ 9’ 10’ 12’ 2923 3017 3245 3627 3710 4101 4534 4716 6202 3557 3651 3982 4464 4650 5086 5769 5951 7301 HB-SS-363 HB-SS-364 HB-SS-365 HB-SS-366 HB-SS-367 HB-SS-368 HB-SS-369 HB-SS-3610 HB-SS-3612 4526 4718 5046 5375 5966 6471 7213 7393 10254       36” 3’ EB-SS-363 4’ EB-SS-364 5’ EB-SS-365 6’ EB-SS-366 7’ EB-SS-367 EB-SS-368 9’ EB-SS-369 M M M M M M M M M w/ Fixed Mid-Shelf CB-SS-364 2 4089 M 4725 CB-SS-365 2 4415 M 5155 CB-SS-366 2 4746 M 5580 CB-SS-367 4 5341 M 6283 CB-SS-368 4 5851 M 6837 CB-SS-369 4 6584 M 7819 CB-SS-3610 4 6761 M 7999 CB-SS-3612 4 8730 M 10130 2 2 2 4 4 4 4 4 6 M M M M M M M M M WIDE 8’ 10’ EB-SS-3610 12’ EB-SS-3612 Open Base 1-1/2” BACkSpLASh uNiTS Sliding Doors Hinged Doors Length Model # EF-SS-303 EF-SS-304 EF-SS-305 EF-SS-306 EF-SS-307 EF-SS-308 EF-SS-309 EF-SS-3010 EF-SS-3012 (Add ”M”) 3299 3398 3693 3981 4285 4742 5287 5467 6779 Model # # of Doors w/ Fixed Mid-Shelf (Add ”M”) Model # HF-SS-303 HF-SS-304 HF-SS-305 HF-SS-306 HF-SS-307 HF-SS-308 HF-SS-309 HF-SS-3010 HF-SS-3012 # of Doors 2 2 2 4 4 4 4 4 6 Approx. w/ Fixed Mid-Shelf Cubic      EF-SS-243 EF-SS-244 EF-SS-245 EF-SS-246 EF-SS-247 EF-SS-248 EF-SS-249 EF-SS-2410 EF-SS-2412 $2587 M $3089 2684 M 3182 2873 M 3431 3063 M 3693 3334 M 4035 3504 M 4259 3970 M 4851 4152 M 5031 5737 M 6437 HF-SS-243 HF-SS-244 HF-SS-245 HF-SS-246 HF-SS-247 HF-SS-248 HF-SS-249 HF-SS-2410 HF-SS-2412 2 $4082 M $4585 2 4278 M 4776 2 4561 M 5119 4 4838 M 5468 4 5445 M 6149 4 5843 M 6600 4 6479 M 7362 4 6658 M 7539 6 8995 M 10112      CF-SS-244 CF-SS-245 CF-SS-246 CF-SS-247 CF-SS-248 CF-SS-249 CF-SS-2410 CF-SS-2412 2 $3693 M $4194 2 3969 M 4530 2 4255 M 4887 4 4865 M 5568 4 5256 M 6016 4 5891 M 6774 4 6075 M 6951 4 7437 M 8461 NOT AVAILABLE         NOT AVAILABLE   24” 3’ 4’ 5’ 6’ 7’ (Add ”M”) Feet 30 38 47 56 66 74 83 92 109 4793 35 4986 45 5382 55 5759 66 6395 76 6963 87 7795 97 7976 107 10582 128 WIDE 8’ 9’ WIDE 8’ 9’ 44 10’ 12’ 3’ 4’ 5’ 6’ 7’ 2728 M 2825 M 3037 M 3252 M 3476 M 3839 M 4233 M 4411 M 6082 M CF-SS-304 2 3833 M 4405 CF-SS-305 2 4136 M 4790 CF-SS-306 2 4444 M 5171 CF-SS-307 4 4999 M 5810 CF-SS-308 4 5474 M 6379 CF-SS-309 4 6150 M 7208 CF-SS-3010 4 6330 M 7386 CF-SS-3012 4 8230 M 9518 4224 M 4412 M 4727 M 5032 M 5586 M 6059 M 6740 M 6920 M 9468 M       30” 10’ 12’ (Approx. Shipping Weight Is 50 Lbs. Per Lineal Foot) Heavy Duty Bolt-On Style Legs On All Enclosed Base Tables! 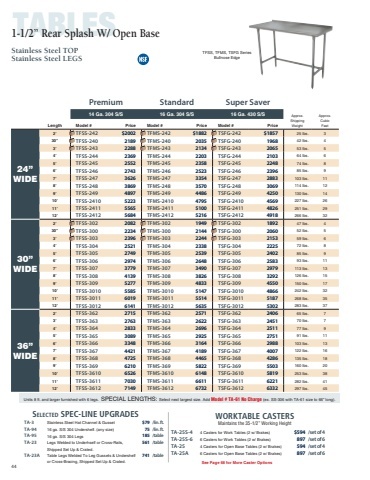 *Please add ”M” after model number when adding Fixed Mid Shelf & refer to prices below  FOR 36” WIDE 1-1/2” SPLASH UNITS: Use 36” Flat Top Price and Replace ”B” with ”F” (Example: EB-SS-364 would change to read EF-SS-364)  Call For Installation of Buyout Equipment!